Sometime after his first major gig at the Fleischer/Famous animation studio, before he started doing work for Topps and likely just before the time he was partners at an independent art agency with Ben Solomon, Woody Gelman developed a comic character called Nutsy Squirrel in 1946. Woody wrote and an artist named Irving Dressler drew, although both apparently dropped out very early on. I suspect Woody bailed when he started his art agency with Ben Solomon. Originally introduced in the first issue of the DC comic Funny Folks in April 1946, Nutsy got his first cover with issue #4 and eventually was starring in two books as Comic Cavalcade, a superhero comic became a Funny Animal book commencing with issue #30 in December 1948. Funny Folks became Hollywood Funny Folks for a bit but became Nutsy Squirrel with issue #61 in September of 1954. After a dozen issues as the title character, Nutsy expired with issue #72 in November 1957 as TV continued its meteoric ascent as the primary entertainment vehicle for the kiddies.. 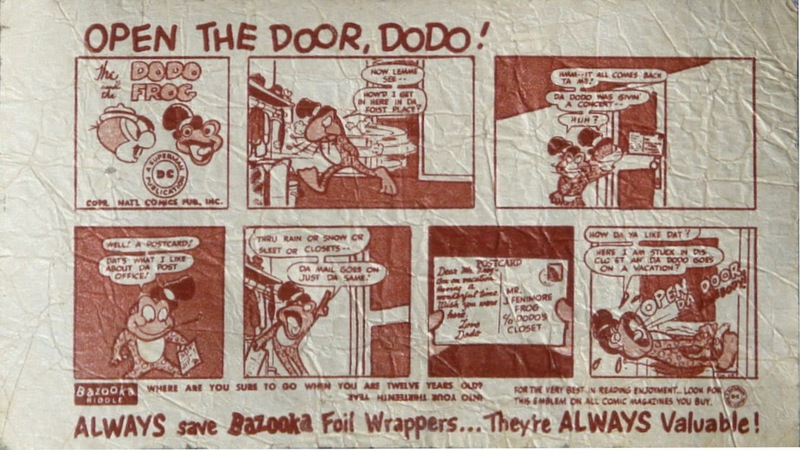 The DC connection is interesting in view of some early Bazooka comic series featuring DC characters, among them some Funny Animals. It seems quite possible that Woody was the conduit through which the DC comics made it to Topps as this occurred around the middle of 1949, when Solomon & Gelman were already working on projects for the company. 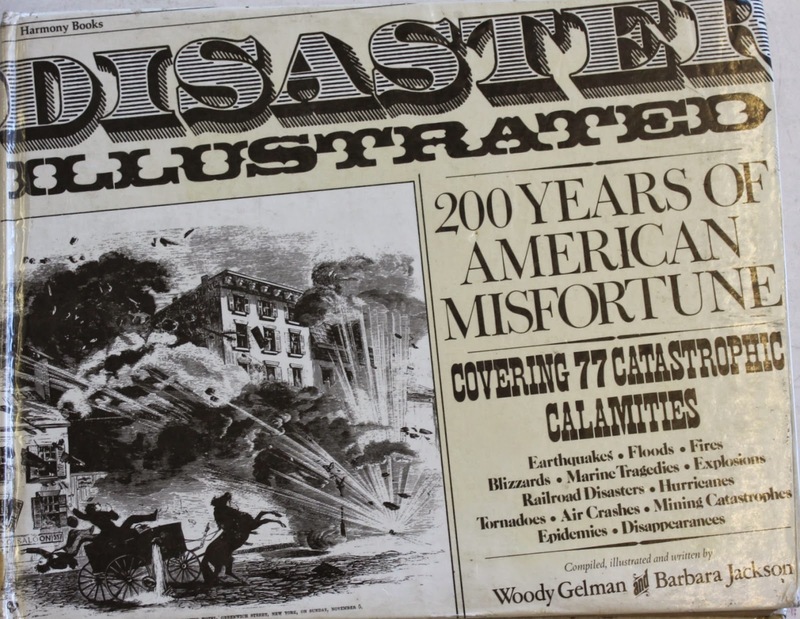 Note the small DC logo near the bottom right corner (above the "l" in "valuable"). I am trying to determine if Nutsy ever appeared on a Bazooka comic as that would be elegantly serendipitous. Nutsy did make it to TV though, albeit as a static image with voiceovers describing the action in what must be the cheapest show ever made. 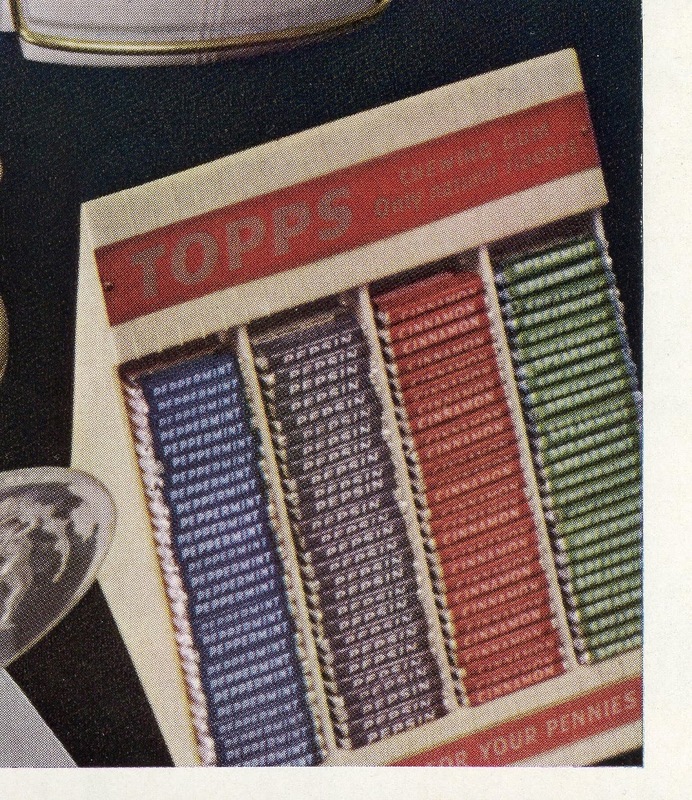 I wonder if Barbara Jackson is the same as Barbara Gelman,who "edited" Topps Fan Magazine back in 1965? It's not Woody's wife (her name was Lil) but maybe it was his daughter. Or not. I'm not sure where Woody found the time to work at Topps! He even appeared on an episode of To Tell The Truth in early 1974; sadly I can't find a video of it on youtube. 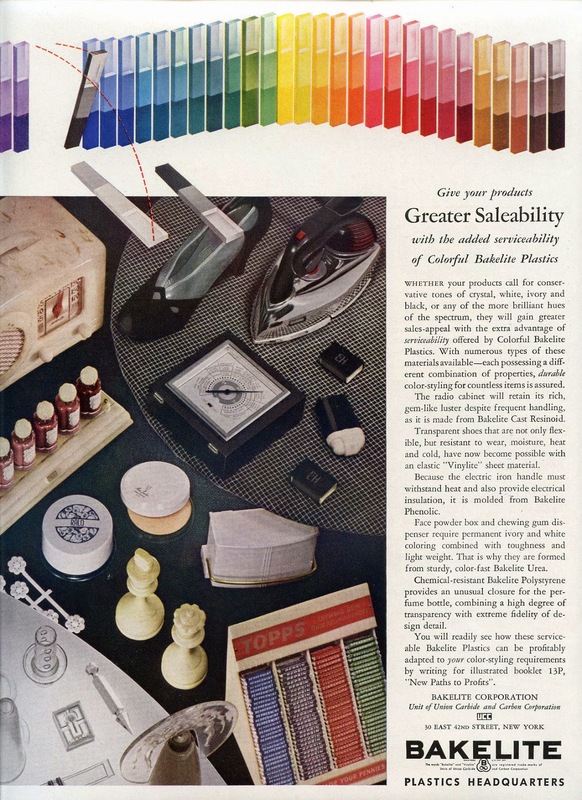 Bakelite was essentially an early form of plastic, a bit more brittle than the stuff we are used to today. Shep says it's the first time he's seen one of these displays other than in darker colors. All these displays date from around 1946-47 I would say as the canister has a 1946 copyright. Well oddball items just keep popping up from the 1960's Rookie Banquets Topps used to throw every year. 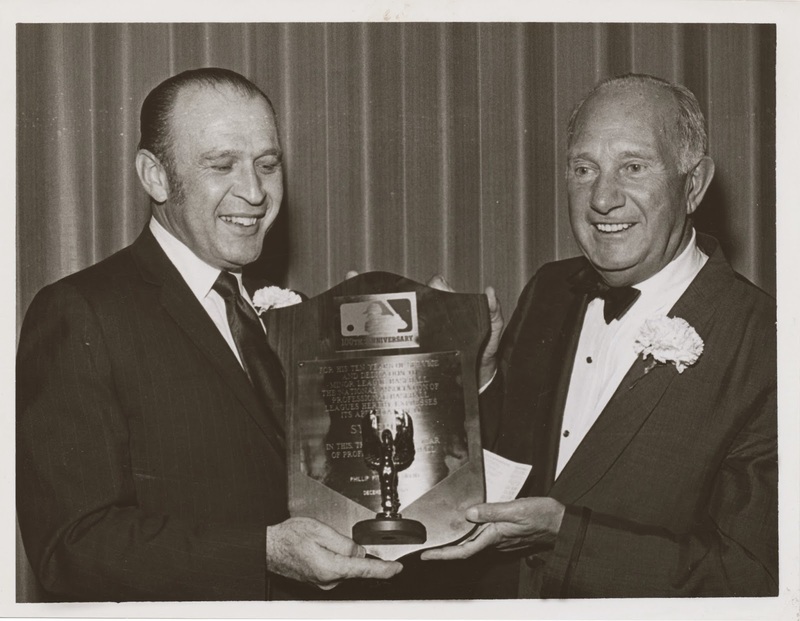 Take a gander at the baubles below: a tie tack and cuff links purportedly given to J.C. Martin, a 1961 Rookie All Star award winner (even though he had a card in 1960 he only had cups of coffee in 1959 and '60) who must have led the AL catching field in a weak year. In 1961 Martin played in 110 games while batting .230 and knocking in a whopping 32 runs in what may have been his best offensive season. While he may not have been a slugger, he was a whiz with the glove and got himself some additional hardware with the 1969 Mets, who directly benefited from a lucky play of Martin's in Game 4 of the World Series. With the immortal Rod Gaspar on second base in a 1-1 game, Martin pinch hit for Tom Seaver in the bottom of the 10th. He bunted and the pitcher fielded the ball and threw it to first, hitting Martin, running to the inside of the baseline, in the arm. The Orioles cried interference but the ump said JC had not intentionally done so and the run counted. The tally put the Mets up 3 games to 1 and they never looked back. This play allegedly led to the creation of the running lane to the outside of the baseline, commencing 45 feet away from the bag, for the 1970 season. JC was gone by then though, traded to the Cubs in the offseason. Did you know the Mets carried three catchers on their postseason roster in '69? Yep: the starter Jerry Grote, Duffy Dyer and ol' JC. Crumb is discussing, of course, the quite infamous first issue of Zap Comics! Woody, being Woody, was likely ordering 25 copies of one of the most famous underground comix ever published to distribute to his friends and colleagues. 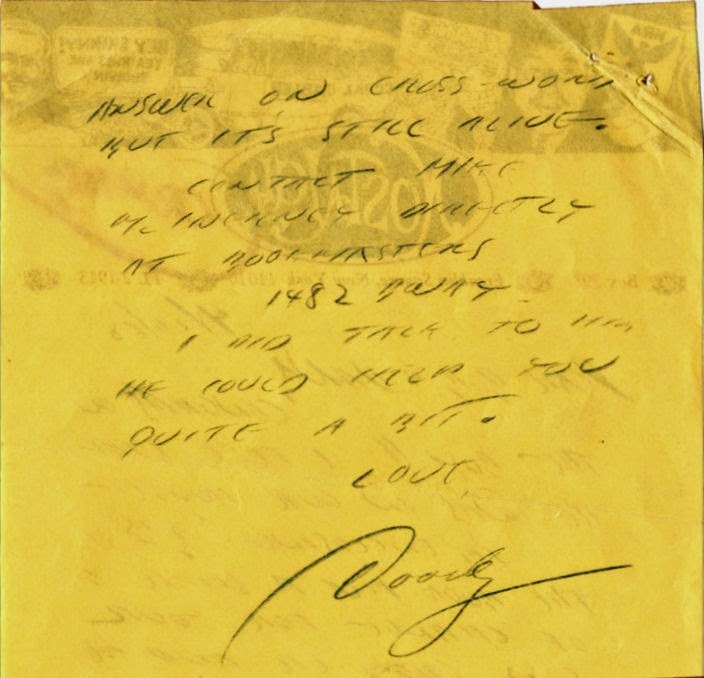 Currently that's something on the order of a half million dollars worth of pulp that Woody got for a mere $3.75! 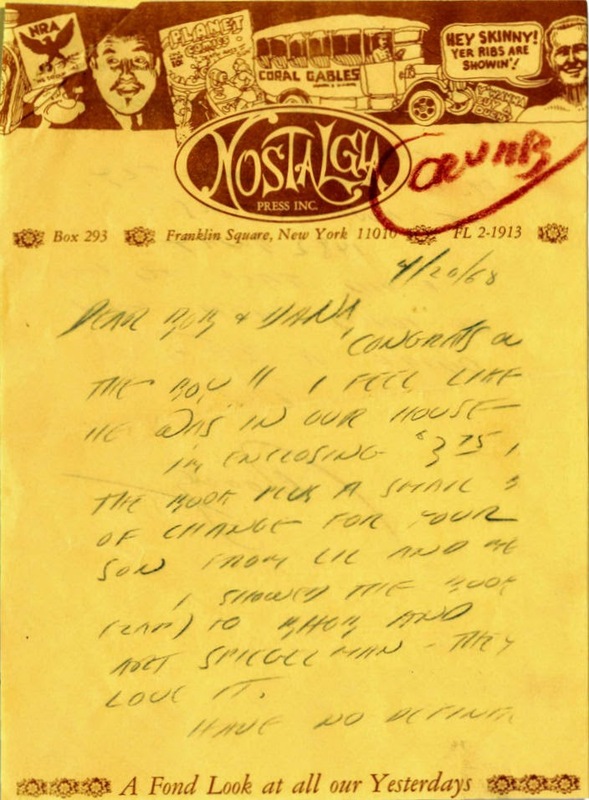 There is some good information in this letter concerning the print run of the first issue's first run, which would be in excess of 3,500 copies a figure toward the upper end of estimates for this historical artifact. It would appear 4,000 to 5,000 first edition copies would have been run I think. It also appears Woody had received copies previously. You also get wind of Crumb's firstborn, Jesse; the search for a New York distributor; and a query as to whether Bhob Stewart (the longtime reviewer at Publishers Weekly and generally a comics historian) had seen the first issue. I love the Nostalgia Press letterhead! I also get the distinct impression Crumb and his (first) wife had visited Woody recently at his home in Malverne, Long Island, NY. 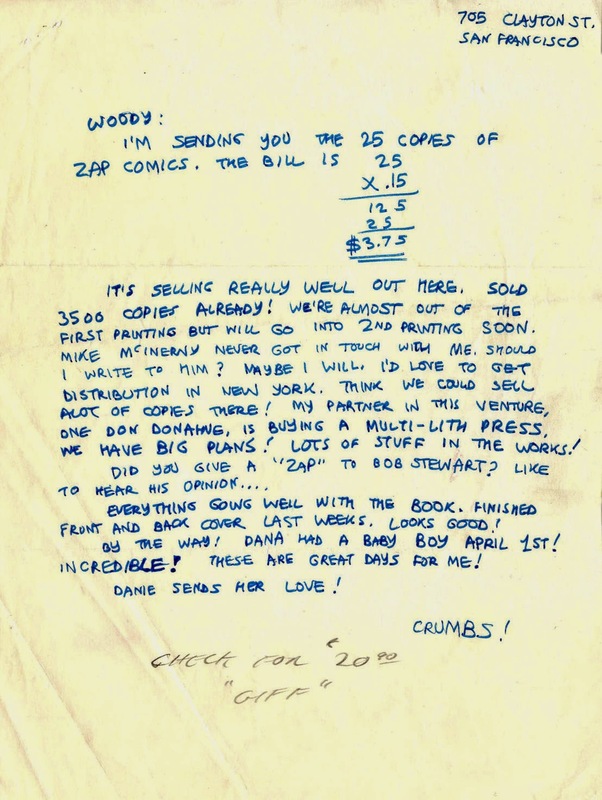 Woody's handwriting is atrocious, worse than mine even, and I can't make everything out (there is some sort of "familiar" abbreviation to boot ) but Woody definitely showed Zap #1 to a very young Art Spiegelman, which is kind of mind blowing! Let's not overlook that $20 gift to young Jesse Crumb either-these guys were clearly friends. Woody was a prime mover in subversive comic art and the extent of his involvement and appreciation in the movement seems to grow every time another bit of information is uncovered. And this all needs to be put into historical perspective as Woody was writing back to Crumb two weeks after Martin Luther King was murdered. It was a chaotic time in America. I have a few more Sy Berger press photos to share today, all from the 1960's. 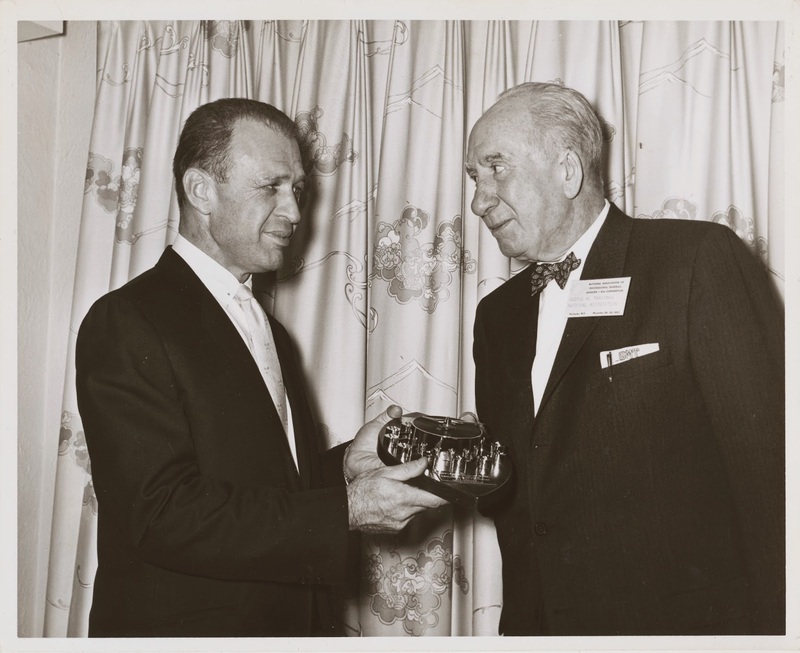 Here is Sy receiving an award from George Trautman at the 1961 Minor League Convention in Florida. Trautman was a minor league executive who became President of the National Association of Professional Baseball Leagues (NAPBL) in 1947. 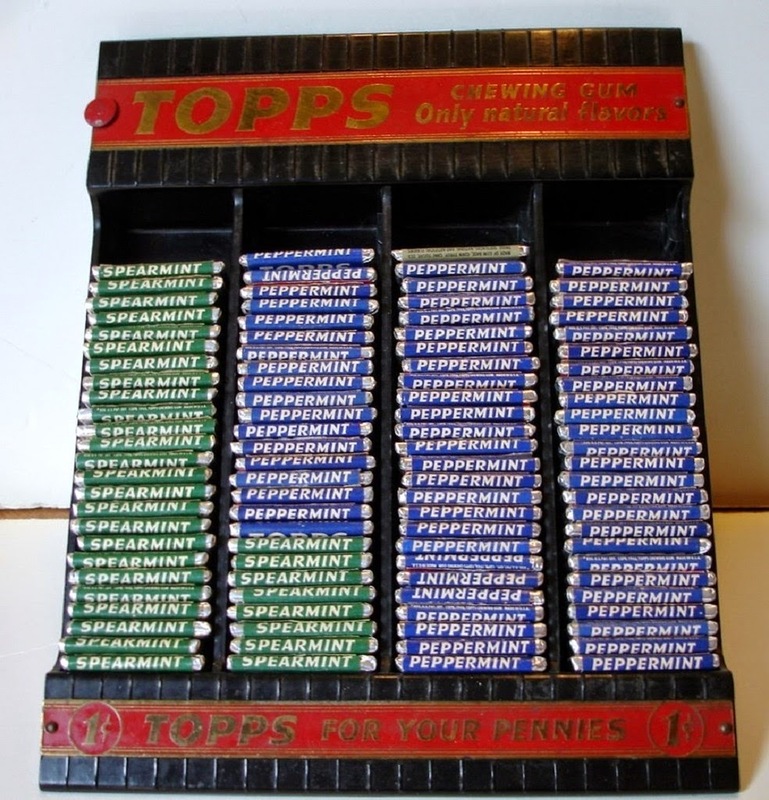 Berger was a fixture at such events starting in 1959, when Topps began giving out their rookie awards . Same folks, same award, different locale. 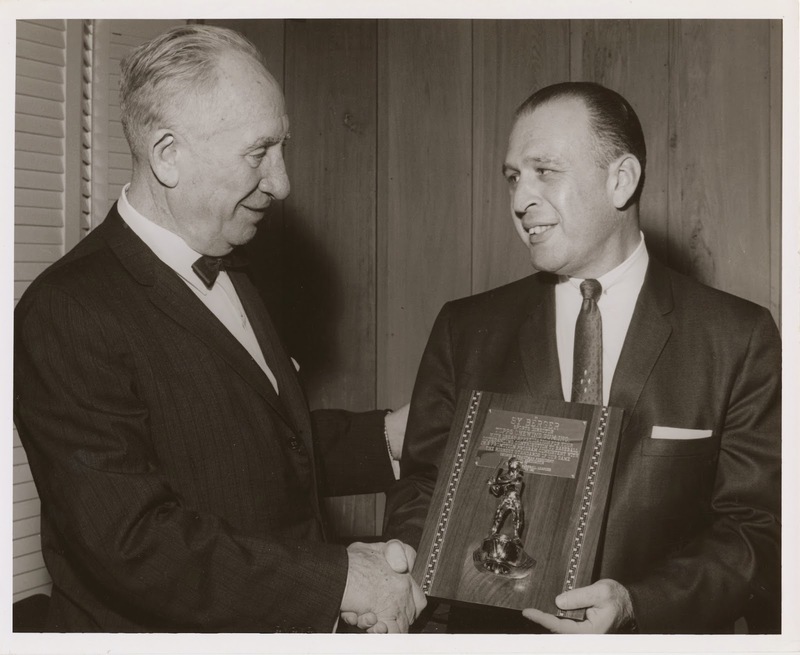 Here is the 1962 award presentation held in Rochester, NY in December of 1962. Trautman would die the following year while still in office. 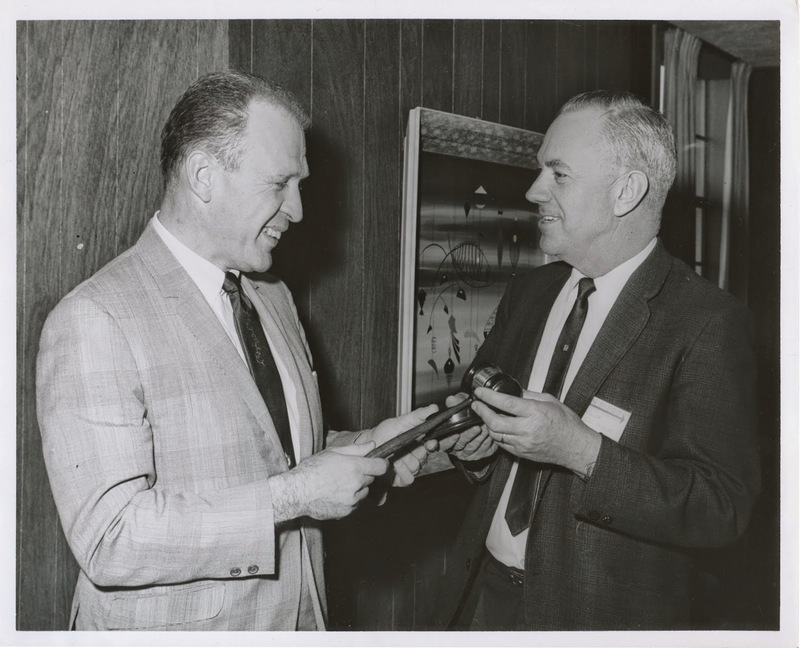 Here Sy presents an award to Earl Keller, the longtime sportswriter for the San Diego Tribune, in December 1963. I suspect this one was shot in San Diego and that it may actually have been the presentation of a ceremonial gavel. Sy must have received dozens of awards on the rubber chicken circuit over the years. I have a handful of other Sy Berger press photos that I am trying to find details on. I'll post them here soon.